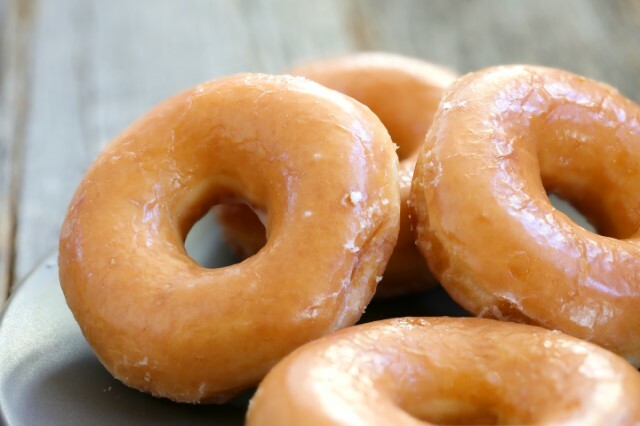 Diabetes has, sadly, become a very common problem in the United States. Almost one in ten people have the disease, which is bad enough, but almost another three in ten more have what is known as prediabetes. As you could possibly guess, prediabetes is a condition wherein blood sugars are elevated, but not to the point someone can be diagnosed as actually having diabetes. That said, prediabetes means someone is well on his or her way to this disease. Essentially, just about everyone in our country is either diabetic, prediabetic, or knows at least a couple of people who are. 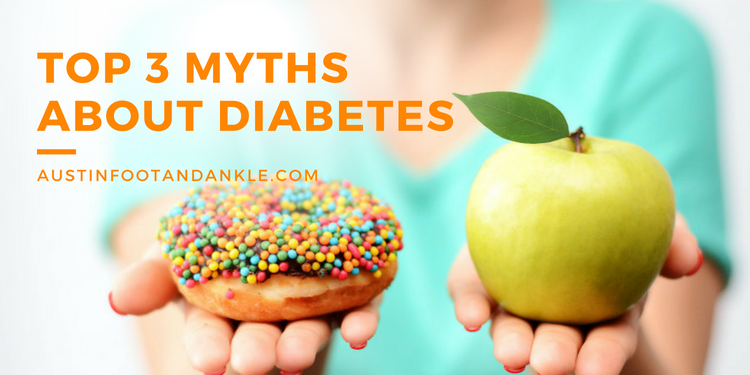 Now, in spite of the commonality, there are some myths about this disease that simply must be cleared up, including the following we consider to be top-3 myths about diabetes. Myth #1 – Diabetes is not very serious. Perhaps on account of how commonplace the disease is, or maybe just simply misunderstanding, some people think diabetes isn’t a big deal. That is absolutely, profoundly wrong! Diabetes is an extremely serious disease. Those who think “it’s just too much sugar in your blood” need to understand that excessive sugar is a huge problem – one that causes systemic damage. Putting aside the dangerous effects diabetes can have on feet (which we’ll address soon enough), elevated glucose levels increase the risk for neuropathy, blindness, kidney disease, heart attacks, and strokes. Clearly, this is a very serious matter. Myth #2 – If you are overweight or obese, you will definitely develop Type 2 diabetes. Many people might think this is true, since they know Type 1 diabetes is caused by genetics and other factors (and not lifestyle choices). Or perhaps they know being overweight/obese contributes to increased risk. Well, just because the risk is higher doesn’t necessarily mean excessive weight gain will guarantee Type 2 diabetes development. The key here is the fact that the higher risk for Type 2 diabetes is on account of eating too many sweets, candy, and drinking sugary beverages – all of which contribute to both diabetes and weight gain. Myth #3 – People with diabetes cannot exercise. Not only is this false, believing this myth can take away your opportunity to improve your health. That being said, diabetic individuals should probably avoid certain forms of exercise. In particular, it may be best to stay away from high-impact exercises and too much aquatic activity. Walking is generally considered to be a low-impact activity, yet it can still possibly contribute to Charcot foot. When we discuss this further in a bit, imagine what would happen if a diabetic foot sustains force loads from running – an activity that can place twice as much force on a foot as the amount it endures while walking. With regards to aquatic-based activities, these are great in the fact they place no-to-little physical stress on joints and bones. The only problem is that being in water for too long weakens skin and can make it more easily susceptible to damage. If you decide to start swimming or doing aqua aerobics, you need to understand the risks and be very careful. Now let’s take a look at how disease affects feet, and what you can do to stay safe! Two major conditions affecting feet from diabetes are Charcot foot and diabetic foot ulcers. In a very brief synopsis, Charcot foot is a condition wherein your feet can become severely deformed due to brittle bones breaking every time you walk. You might be thinking “But I would notice if my bones were breaking!” Well, diabetic neuropathy (nerve damage) can keep that from happening. Even worse, diabetic ulcers have a mortality rate that is worse than several forms of cancer, including breast, colon, and prostate cancers. The good news is that there are actions you can take to protect your feet! To start, taking care of your overall health and managing your diabetes will keep your circulation stronger and your nerves healthier, which in turn will help protect your lower limbs. Carefully managing sugar levels, maintaining a good diet, refraining from smoking or alcohol abuse, and getting plenty of exercise are good (and necessary!) for your whole body, including your lower extremities. To minimize the risk of infection, keep your feet clean, dry, and protected. Wash your lower limbs gently in warm water and dry thoroughly, including between the toes. Use a moisturizer (everywhere but between the toes) to keep dryness and cracking at bay. Keep your feet protected by always wearing a comfortable, supportive pair of shoes that fits you well whenever you leave home, and check the inside of your shoes before putting them on to make sure they do not contain foreign objects. Although footwear can protect you from stepping on foreign objects, shoes that don’t fit well can lead to sores, blisters, corns, or other conditions due to painful friction. One of the most important aspects of diabetic foot care is how you take care of your feet at home. You see your feet every day – we don’t. Catching problems early—and seeking help promptly—is the best way to avoid serious complications, such as amputation of a toe or foot. Too many foot issues go unnoticed and become major issues so it’s essential to give your feet special attention on a daily basis. Daily inspection is one of the pillars of smart diabetic foot care. Once a day, preferably at night, take the time to carefully inspect your feet, both visually and with your hands. If you see or feel anything out of the ordinary, you need to contact us and make an appointment at one of our Austin offices. Cuts, scrapes, and abrasions. Any break in your skin creates an open doorway for microorganisms to enter your body and cause mischief that can turn into dangerous conditions. Changes in skin color. If you note any color out of the ordinary it is an indication that something is already wrong. Contact our practice or—if you discover skin that is blue or black and cold—head right to the emergency room. Blisters and sores. These may be caused by your footwear and you will need to change to a pair that fits better. We can help you find ones that work better for you. Anything else that is out of the ordinary. Any abnormal coloration, texture, temperature, appearance, etc. is a possible red flag. Your best practice is to catch any of these at the earliest opportunity and then contact our team. The daily inspection is important because diabetes can lead to neuropathy, which is nerve damage that interferes with your ability to feel pain or abnormalities. You want to stay on top of issues, and this will help you with doing so. Instead of only coming in when you find something concerning, you should come to see us for regularly-scheduled appointments. Remember, we are both on the same team when it comes to your foot health! Seeing us for regular appointments makes it more likely that issues are caught at their earliest stages and treated appropriately by our experts. Additionally, we can provide tips and advice to lower the odds of having problems develop in the first place. If you don’t already have a diabetic foot care plan in place, our team at Austin Foot and Ankle Specialists can help you develop one. For more information about diabetic foot care—or to request your appointment with one of Austin’s leading podiatric experts—contact us by calling (512) 328-8900 or take a moment to request your FREE copy of our book Diabetes and Your Feet right now!